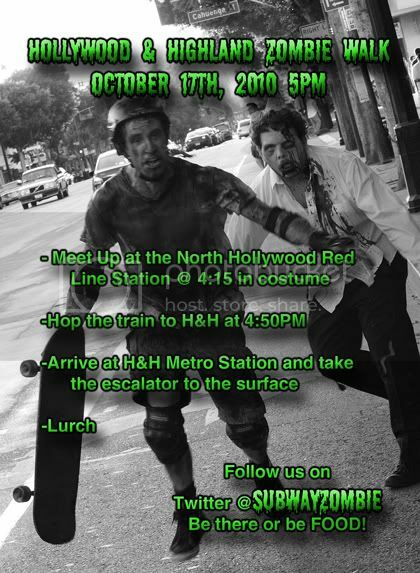 2nd Annual Hollywood Subway Walk - 10/17/2010 - Zombiewalk.com - Your source for all Zombie Walk and Zombie Flash Mob planning! Had a great time with last year's lurch. I'm interested in seeing if we can get an even bigger turnout this year. So, same setup as last year. We'll be gathering at the North Hollywood Red Line station at 4:15pm on Sunday October 17th, 2010, for an underground assault on Hollywood and Highland. We'll break through to the surface at 5:00pm in Hollywood. UPDATE: According to our facebook invite we've broken 500 attendees this morning. We've got more than 600 "Maybes" listed. I'm not sure if one train would be able to take us all in one go. In light of this, I'd like to mention that if it's easier for you to get to Hollywood and Highland by northbound train on the Red Line, then do so. But I want to stress that we all get to the H&H station by 5pm so we can all hit the surface at the same time. Please share the facebook event. I'll update this original post as more details become available. Last edited by Zedword; 10-12-2010 at 09:12 AM. This sunday Sunday SUNDAY. Facebook tells me that we're coming up on 1200 undead for this Sunday's walk. Knowing this walk is coming is keeping me awake at night. Here's a list of links to flickr and photo pages acroess ther interwebs for you to enjoy from this past Sunday's Lurch. I'll update as I find more. Attacked by a flashmob of Zombies!! Zombie Walk, Los Angeles, CA Oct. 17th, 2010. Placeholder. I think there may be images here soon. Last edited by Zedword; 10-27-2010 at 10:55 PM.